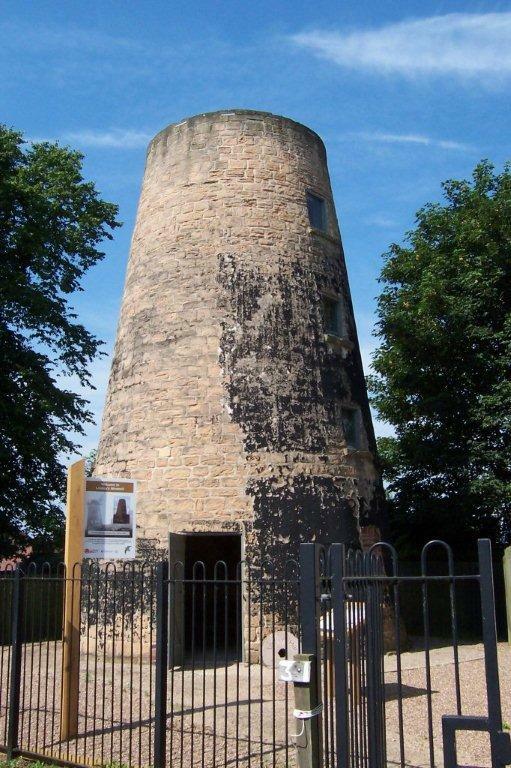 Lindley’s windmill on Prospect Place, Sutton-in- Ashfield was built in 1820 by James Lindley, a local farmer, miller and baker. It replaced a post mill which stood on the corner of Mill Street and High Pavement. The post mill was being moved to the site where the tower now stands when it overturned in the process and was irreparably damaged. Lindley’s tower mill provided flour for the daily bread of the people of Sutton and animal feed for cattle for about 80 years. It stood in a state of ruin from c1900 until 2003 when the development of bungalows was at the planning stage. The developers, Metropolitan Housing Trust Ltd, agreed to take measures to conserve the building and provided doors, windows, fences and groundworks. Later, funding was obtained from the Heritage Lottery Fund to finance a roof, windows, ventilation and interpretation and sign boards. In 2015 a wooden floor was fitted, partially funded by the Society for the Protection of Ancient Buildings (Mills Section). Members of Sutton Heritage Society have worked closely with Ashfield District Council throughout all the conservation works and have produced two books, “Mills of Sutton” and “Lindley’s Mill”. They have also been successful in acquiring an interesting collection of artefacts and have established a museum in the mill. A professional video has been produced which tells the story of the mill and demonstrates how it would have worked. The search for more artefacts continues. Although the museum is not open on a regular basis it will open as part of the national schemes; National Mills Open Week and Heritage Open Days*. Visits can also be arranged by appointment for individuals and groups by contacting Sutton Heritage Society on 01623 623508 or 07885 673538. * Unfortunately the Mill will not be open for the Heritage Open Days in September 2018.